The Kansas Department of Transportation has joined together with seven other states in the Mid America Association of State Transportation Officials (MAASTO) to develop a multi-state Truck Parking Information Management System. This TPIMS project will improve the safety and efficiency of America’s freight network by providing real-time parking availability information to truck drivers through dynamic message signs, smart phone applications, traveler information websites, and other communication methods. With implementation of the regional TPIMS project, commercial truck drivers will be able to find available parking more easily and efficiently route themselves to those locations, increasing their productivity and lowering their costs. In 2013 a national survey revealed that 83 percent of drivers routinely took longer than 30 minutes to find parking. Drivers who have not located parking before reaching their hours of service limits are often forced to park illegally or unsafely, often on the shoulders of highways, on off ramps, or at abandoned facilities. This loss of productivity adds six percent or more to labor costs associated with moving goods through the national freight network. KDOT began installation of TPIMS on Monday, December 11. These signs will provide the number of available truck parking spaces at 18 rest areas along I-70. 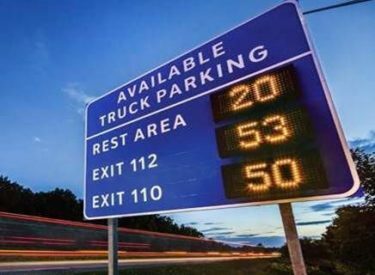 Each sign shows parking spaces available for two to three rest areas to give trucks an idea how full parking areas are five, 30, 60 miles ahead, as an example. We are using a “computer vision” system that uses cameras to build a 3D image of the parking area so available spaces can be automatically detected. Most rest areas will have two camera poles installed near the truck parking area and each pole will have three cameras mounted on it to produce the 3D image. Deployment of this innovative system is scheduled for the Fall of 2018.